Heading to the pool with a baby or toddler can be filled with trepidation – how will they behave? What should you pack? What will the facilities be like? Will the staff be understanding? Suddenly, popping to the local leisure centre is an operation requiring military precision. Not so at Center Parcs. We understand your concerns, so we’ve designed the experience of the Subtropical Swimming Paradise to be as easy as possible. With these tips, you’ll have a happy and hassle-free trip to the pool with your little ones, whether it’s their first time or fiftieth time in the water. Sean Murphy has been part of the Center Parcs team for 27 years. He’s now the Subtropical Swimming Paradise Manager at Elveden Forest. Having seen thousands of families come and go over the years, his tips come from a wealth of experience. Top of the list to remember for little ones, of course, is swim nappies. For toddlers and older children, arm bands and goggles will make everyone’s lives easier. Towels with hoods are also great for making changing time into a game. Don’t stress, just pop to Aquatique, our one-stop swimming shop. There’s nappies, toys, inflatables, costumes, caps and goggles – there’s even a free goggle-fitting service to make sure they won’t leak in the pool. The battle of the changing room can be the most dreaded part of the whole trip if you have little ones in tow. So to make it a breeze, we have family changing rooms that you can all use together, complete with changing table. Hassle = gone. As little ones get over-excited and over-tired, wouldn’t it be great to have somewhere private to relax for a while? Hire a family cabana at any of our Villages for your own enclosed space with free soft drinks, comfy seating and a television. They’re the perfect place to rest and recuperate with a snack before you head back to the pool. “Most public pools these days have ban photography,” explains Sean, which means you miss out on capturing those memories. But we know how important that is to you, so not only do we allow photography of your own group, we also have roaming photographers who’ll happily take professional snaps of you and your little ones that you can purchase. Did you know that experts advise it’s safe to take your baby into a pool from just six weeks old? Babies have a natural affinity for water and in instinct to hold their breath if needs be. For their first time, it’s important to give lots of praise and eye contact. You could practise blowing bubbles under the water together. Do you have any tips of your own with little ones in the Subtropical Swimming Paradise? Share them below. The post Our top tips for swimming with little ones appeared first on Under the Treetops. The Center Parcs forests are spectacular all year round, but we can’t deny that some of our activities really sing in the height of summer. There’s nothing quite like cruising around the lake while the water sparkles, or tearing up the Quad Biking track in glorious sunshine. So here are our top picks for activities to try during your summer break this year – plus a few wet weather ideas in case all doesn’t go to plan. Without a doubt, the lake is the place to be when the sun has got his hat on. If you fancy something leisurely, hire one of our Electric Boats which do all the hard work for you as you sail in comfort, taking in the best views of the Village. Or if you’re in the mood for a little more action, why not try out Stand Up Paddle Boarding? It’s great fun and test your balance and co-ordination – not to mention your core strength. If you’re a natural, you might even get to try a paddle board headstand! If you prefer your watersports with less chance of taking a dip, hire a canoe. You can take in laps of the lake at your own pace, dodging swans as you go. There’s always something exciting to try at the Outdoor Activity Centre. Why not kick up some dust with Quad Biking (or Junior Quads for younger ones)? You’ll learn how to drive these tough, all-terrain quads before really putting them through their paces on our bespoke off-road track. Or perhaps you’re a real-life Katniss Everdeen who can rack up the bullseyes in Target Archery. After being shown how to use a bow and arrow safely, you’ll compete in a series of games and tournaments to see if you’re a crack shot. Will you make it onto our highest scorers leaderboard? If you’ve got a head for heights, you’ll love what goes down (or up?) at Action Challenge. Slip on a harness and helmet before making your way across Aerial Adventure, our obstacle course in the canopy. Suspended up in the trees, you’ll tackle rope bridges and ladders before making your final descent on a thrilling zipwire. If the weather doesn’t behave, it doesn’t mean you have to stop play on your break. Take a trip to the Pottery Painting Studio for all-weather family fun. Choose a piece of pottery from our wide selection and let your creative side out with brushes, sponges and stamps. Once you’re finished, we’ll professionally fire and glaze it for you to take home and treasure. What other activities are on your summer to-do list for this year? The post Your Center Parcs summer activity to-do list appeared first on Under the Treetops. Waanzinnige Woensdag, extra voordelig naar Center Parcs! Vandaag is het weer Waanzinnige Woensdag. Boek al vanaf €299,- 3 nachten voor 6 personen! Profiteer nu! Deze namiddag werd in Vossemeren de 'Belevingsbox Bosland - Nature Cabana' ingehuldigd. Het is een soort kijkdoos geworden waarin toeristen van het park een blik krijgen op de Sahara, Pijnven en Hobos. Het is een samenwerking tussen Bosland en Vossmeren. De eerste bestaat dit jaar 10 jaar, de tweede mag volgend jaar al 30 kaarsjes uitblazen. En dit zal zeker niet onopgemerkt voorbijgaan, maar daarover later meer. Natuur en duurzaamheid zijn altijd al belangrijke pijlers geweest bij Center Parcs. Elk park bestaat voor 90% uit bos en water en onder leiding van huisbioloog Jean Henkens creëert Center Parcs een omgeving waar mensen, maar ook dieren en planten, zich thuis voelen. Omdat natuur zo belangrijk is, werkt Center Parcs al jaren samen met verwante partners om bewustwording bij kinderen en hun ouders te creëren over het belang van duurzaamheid voor mens en natuur. Het is binnen deze context dat deze 'kijkdoos' vandaag werd voorgesteld. Dankzij deze 'box' hopen beide partners om nóg meer toeristen de weg te laten vinden naar de prachtige natuur die Bosland te bieden heeft. Vorig jaar alleen al waren er 25.000 toeristen die via de achteringang de doorsteek naar de Sahara ontdekten; dankzij deze investering kan dit aantal nog hoger oplopen. To celebrate the upcoming launch of the Elveden Forest Treehouses, we challenged our Village Life readers to design their own dream treehouse with the chance to win a family Center Parcs break. First there were the email entries – professional-standard computer modelling, video walkthroughs and even treehouses ingeniously created in Minecraft. Then the amazing pictures and drawings began arriving, from colourful collages by little ones to intricate, detailed blueprints. Then came the sculptures – every day for weeks, our desks were slowly submerged under giant boxes of beautifully crafted, 3D models of the most imaginative treehouses – from one made of sweets and gingerbread, to an ‘under the sea’ themed creation. They were all amazing, and as ever, we were blown away by your creativity and commitment. But one entry had the whole office talking, and staff making special trips to our corner to admire it. It was the clear winner. The Stevenson family created their ‘Four Seasons Treehouse’ over five weeks. It was painstakingly assembled from dead branches. “Then we made the little houses from lollipop sticks, and the idea just kept on developing,” explains mum Kate. There are four miniature Lodges on their creation, each one themed around a different season. Spring is covered in colourful blossoms, and autumn in golden leaves. There are sea shells and rolled up ‘beach towels’ in the summer Lodge, and a tiny, fully decorated Christmas tree in the winter Lodge. But the detail doesn’t end there. There’s a library with miniature versions of some of the family’s favourite books – including Harry Potter and Robin Hood, an outdoor dining table, set for dinner, a water slide, a hanging bench made from balsa wood and even a tiny sail boat for venturing out on the lake. The whole thing is decorated with artificial cherry blossoms and the overall effect is, well, breath-taking. Kate and husband Scott created the work of art with their two children, four-year-old Molly and two-year-old Tom. Although they did most of the structural work (of which there was a lot! ), the little ones helped out where they could. “Molly did most of the painting and flower gluing,” explains Kate, “and the playing with it when it was finished, of course! She came up with lots of ideas too – she wanted the water slide and the Christmas tree in the winter Lodge.” Little Tom, meanwhile, mostly played with the shells and did some painting of his own. We’d like to thank every single guest who entered our competition – it was such a joy to open all of your wonderful entries. For their incredible effort, the Stevenson family have won a family break at Center Parcs this summer. The Four Seasons Treehouse, meanwhile, will be going on display in the reception area of our Head Office. The post We asked guests to design their dream Treehouse. You won’t believe what arrived at our office… appeared first on Under the Treetops. Na een succesvolle opknapbeurt van Port Zelande, vooral gefinancierd door particuliere investeerders, wil Center Parcs deze werkwijze ook gaan toepassen op meerdere parken in België, Nederland en Duitsland. De grondige renovatie van de cottages gaat altijd gepaard met een opknapbeurt van de centrumvoorzieningen. Met de opknapbeurt van diverse parken in België, Nederland en Duitsland is een bedrag gemoeid van 400 miljoen euro. Zo blijkt uit een artikel in het FD. “De opknapbeurt is bijzonder grondig”, laat Enrico de Koster, verantwoordelijk voor Center Parcs vastgoed in de Benelux en Duitsland, ons weten: “De cottages worden volledig gestript en opnieuw ingericht. Er is bijna sprake van nieuwe vakantiehuizen. Daarbij wordt ook gekeken naar de centrumvoorzieningen in de parken die we onder handen nemen. Op dit moment wordt er bijvoorbeeld een nieuwe Dome gebouwd in park Heijderbos en in Port Zelande zien de centrumvoorzieningen er inmiddels weer als nieuw uit.” De particuliere investeerder wordt volledig eigenaar van de opgeknapte cottage. The new menu at the Lakeside Inn, Whinfell Forest, launches today (Friday 17 June, 2016). The Lakeside Inn offers some of the most picturesque dining on any of our Villages, perched on the edge of the water, overlooking Whinfell Forest‘s stunning Lake District scenery. The new menu still contains all your old favourites – big, rustic sandwiches, perfectly cooked steaks and a daily carvery. But now there’s lots more besides. There are nostalgic dishes inspired by home-cooked classics – battered fish and chips and a rich, cheesy fish pie. There are some new twists like twice-baked souffle and crispy prawns with chipotle mayo. And on the dessert menu are all your favourites from childhood – the rhubarb crumble and sticky toffee pudding are two of our favourites. As ever, we’re committed to creating menus that our guests with dietary requirements will love. We’ve been speaking to some of our gluten-free guests about their struggles and frustrations with eating out. They told us firmly that fruit is not a pudding. So we listened. At the Lakeside Inn, our gluten-free desserts include a zingy passion fruit roulade and a moist, decadent syrup sponge. Gluten-free or otherwise – try them, you won’t be disappointed. Take a look at some of the new dishes (click on any photo to open the gallery). The post New menu at the Lakeside Inn appeared first on Under the Treetops. De Kids Climate Conference bestaat inmiddels al 4 jaar en is sindsdien altijd een succes geweest. Het is uitgegroeid tot een groots duurzaamheidsevenement dat in Nederland en België wordt gehouden en, sinds vorig jaar, ook in Duitsland. Het initiatief is opgezet door Center Parcs en het Wereld Natuur Fonds, waarbij kinderen betrokken worden bij 'volwassen' onderwerpen zoals duurzaamheid. Het leuke ervan is dat kinderen een frisse en verrassende kijk op de onderwerpen hebben, en zij beleven zelf veel plezier tijdens de vele workshops. De kinderen zullen meer leren over duurzaamheid, maar op een leuke manier! Dit jaar is het thema 'energie'. De kinderen leren niet alleen over energiegebruik, windenergie of zonne-energie, maar ook over mensen-energie! De mens heeft namelijk heel wat in zich als zij vol van energie zijn: denk maar aan het bouwen van grote, hoge gebouwen, en het bedenken van allerlei uitvindingen en medische ontdekkingen. Heb je er weleens bij stilgestaan wat de mens eigenlijk allemaal kan? Fascinerend! Brandstof is voor de mens ontzettend belangrijk want zonder brandstof komen we niet ver (of zelfs niet eens ons bed uit). Voor ons is brandstof alleen geen benzine of een accu, maar juist voedsel. Daar krijgen wij energie van, en daardoor is de mens in staat om dingen uit te vinden, te bouwen, creatieve oplossingen te bedenken, sporten… noem het maar op! Voedsel zou eerlijk verdeeld moeten zijn over iedereen ter wereld zodat we allemaal genoeg brandstof krijgen, en daar streven wij naar. Tijdens de Kids Climate Conference 2016 in Het Heijderbos van 23 t/m 25 september, zullen wij dus samen al onze energie steken in het bedenken van een goede oplossing waardoor ervoor gezorgd dat al het voedsel eerlijk verdeeld wordt. Dat is nog eens een goed doel om je energie voor te gebruiken! Nottingham architecture practice CPMG has designed a new hotel and spa complex for Center Parcs. The £6m development at the Center Parcs Elveden Forest site in Suffolk will comprise 48 rooms adjacent to a nine-hole golf course. It is expected to be completed for autumn. Chris White, project director for CPMG, said: "We have made significant inroads for clients requiring hotels and this is one that we are delighted to see take shape recently. "The new hotel has been designed around the visitors’ needs; we incorporated a subtle entrance area and elevation leading to external balcony spaces which will provide a relaxed and spacious setting for guests. "Based on three floors, all 48 rooms will have a stunning view of the golf course and will sit adjacent to the spa and restaurant facilities. We’re hoping this design will put us on the map in terms of what we can offer for other clients in the commercial and leisure sector." Bowmer & Kirkland Build Services, Edmond Shipway, Elliott Wood and Illuminous are also working on the project. Center Parcs wil zijn Nederlandse vakantieparken een flinke opknapbeurt geven. Het geld dat daarvoor nodig is, zo'n 400 miljoen euro in totaal, wordt bijeen gebracht door de bungalows te verkopen aan particuliere beleggers. Dat bevestigde het bedrijf donderdag na een bericht in het Financieele Dagblad. De huisjes van Center Parcs zijn nu eigendom van institutionele investeerders. Die werken mee aan de verkoop, die bij elkaar 1,2 miljard euro moet opleveren. Een derde van dat bedrag is bestemd voor investeringen, de rest gaat naar de huidige eigenaars. "We investeren continu in onze parken", zei directeur Mark Haak Wegman van Center Parcs. "Dat willen we versnellen." Omdat de genoemde 400 miljoen euro neerkomt op wel twee derde van de jaaromzet, zijn daarvoor nieuwe geldschieters nodig. Stijgende bezettingsgraden bewijzen volgens de topman dat klanten graag blijven komen bij Center Parcs, steeds vaker ook uit het buitenland. Maar ze willen wel meer luxe dan voorheen. "Denk aan een regendouche, een sauna, een kookeiland en een draadloos netwerk om muziek te streamen." Complete inbouw keuken incl. combi magnetron, 16 theaterstoelen, discovloer met licht 2.5 x 2.5 of 3 x 3, 5 zitjes voor 5 personen + stoelen, tuinset, verduistering rolgordijnen, materiaal om catwalk te maken, grote schilderijlijst, brandweer materiaal, vitrinekast, tegoedbonnen bouwmarkt, grote brandweer bel, intercom om iets te kunnen omroepen, brandweerhelmen, zitbanken die tegen een muur geschroefd kunnen worden (zoals in kleedruimte van een gymzaal tbv brandweerkazerne), rode pluchen gordijnen, rookmelders 10, 6 snoeren gekleurde lampjes 60 meter, 2 bureaustoelen, 1 oud bed met nieuw matras, 1 wastafel met kraan, 2 x complete toiletuitrusting in 1 kleur, groot aantal rolgordijnen, kledinghaken 8 x, 1 grote tafel 6 stoelen kantine, TV met DVD recorder, wissellijsten 8 X, grote letters BRANDWEER of bord voor buitenkant, grote bel, hoge drukspuit, tuinslang 20 meter met toebehoren,grote brede mooie showstoel waar kikker in kan zitten. Wensenlijstje wordt vast nog langer maar mocht u ons behulpzaam kunnen zijn graag een pb tje. Center Parcs has a long and strong background of charitable support, offering financial donations and gifts in kind to a range or organisations. We’ve been involved with a number of charities and appeals, both nationally and in the local areas surrounding our Villages. We take very seriously our responsibility to help organisations whose values align with our company and, crucially, with our guests. Those values include the importance of family togetherness, and the belief that every family has the right to spend quality time together. We found a partner that treasures the same things we do; family time. Together for Short Lives (registered charity 1144022 and SC044139) is the leading UK charity that speaks out for the 49,000 children and young people who are expected to have short lives. As part of their work they raise money for the UK’s 54 children’s hospice services so that they can continue to deliver lifeline care and support, allowing families to make their most of their precious time together, no matter how short. Children’s hospices are all charities and rely on support from the public and organisations like Together for Short Lives to deliver their crucial services. Together with everyone who provides care and support to these children and families, Together for Short Lives are there to help families have as fulfilling lives as possible and the very best care at the end of life. They can’t change the diagnosis, but they can help children and families make the most of their time together. Our aim in the next couple of years is to raise awareness and funds to support over 49,000 families who are caring for a child with a life-shortening condition. How will we do this? Passionate staff across our Villages will be hosting one-off events, activities, competitions and raffles to support children’s hospices in their area. We’ll also offer ongoing professional support, sharing some of the expertise within our business with Together for Short Lives. Our guests will have the option to make a donation when they book a break with us, and we’ll match every pound you pledge. Learn more about the vital work Together for Short Lives does in the video on the left. The post Introducing our new charity partner appeared first on Under the Treetops. Holidaymakers at a Center Parcs site were forced to evacuate some of their lodges after heavy rain caused a number of the buildings to flood. The holiday village at Woburn Forest in Bedfordshire was hit by thunderstorms on Sunday night. Center Parcs has yet to comment on the flooding. Meet Stuart Mortimer, 73-year old retired police Inspector-turned professional wood turner, Guinness World Record-holder and whittler to Her Majesty the Queen. In 2011, Stuart worked on the staircases for the three Longleat Forest Treehouses. His work was so remarkable that we just had to ask him to make another four hand-carved, solid wood trunks for Elveden Forest. It’s a process that, unsurprisingly, starts with trees. At Longleat Forest, we were able to source the wood from the Village itself. But winter wather at Elveden Forest at the start of the year made that impossible – so Stuart sourced the wood himself. He made the biggest ever bowl carved from a single piece of wood – it was 8’6” across and held a Guinness World Record. He has hand-carved thrones for Her Majesty the Queen. He spent 27 years in the police force at Heathrow, retiring as an Inspector. Some of Stuart’s work is on display in museums. His first experience with woodworking was when he carved an aeroplane at the age of nine. He still has that wooden aeroplane. Once the tree trunks are delivered to the joinery site, Stuart sets them up on pallets and begins slicing off the bark. Because of the scale of the job, he sourced a brand new piece of equipment, the likes of which he’d never seen before, from Russia. Next, Stuart works on the flutes. These grooves down the length of the wood create a natural, organic look that mimics real life. The flutes are started with a chainsaw, neatened with a plane and finished with sanding. While looking natural, the flutes have to go in specific places so as not to interfere with the treads (or stairs) when the final staircase is created. This is the point where Stuart blends his art and science. The whole process takes around a month of hard work. Once Stuart finished, the huge trunks were fitted with treads and fixtures by Input Joinery, before being shipped to Elveden Forest and assembled inside the Treehouse. The post The man behind the Treehouse staircase appeared first on Under the Treetops. Op dinsdag 31 mei werd in de Soeverein Arena te Lommel de sportdag voor de Center Parcs Groep georganiseerd door Center Parcs Vossemeren. Met meer dan 1400 deelnemers uit Nederland, Duitsland, Frankrijk en België. De uiteindelijke winnaar werd Center Parcs Eemhof te Zeewolde in Nederland. Center Parcs De Kempervennen in Westerhoven gaat op zondag 26 juni van 12.00 uur tot 17.00 uur haar deuren openen voor de regio. Team De Kempervennen neemt dit bijzondere initiatief om buurtbewoners kennis te laten maken met alle faciliteiten en activiteiten het park te bieden heeft. Ook is het een uitstekende gelegenheid voor medewerkers om familie, vrienden en kennissen eens een kijkje te laten nemen achter de schermen. Op deze dag is er van alles te beleven. Groot en klein kunnen genieten van vele (sport)activiteiten. Voor de kleinere onder ons zullen er springkussens aanwezig zijn, kunnen zij gratis graffiti spuiten en zichzelf gratis laten schminken. Deze dag zal er op De Kempervennen een zomermarkt aanwezig zijn met verschillende leuke kraampjes. Natuurlijk mag entertainment ook niet ontbreken: Orry & Friends zijn heel de dag aanwezig en treden diverse malen op. Daarnaast kunt u mee doen aan een prijsvraag waar u kans kan maken op leuke prijzen! Naast al deze activiteiten besteed De Kempervennen op de open dag ook aandacht aan nieuwe collega's. Bent u geïnteresseerd in een baan bij de Kempervennen, kom dan ook zeker een kijkje nemen! En solliciteer direct. Wij verwelkomen u graag op 26 juni! Am Friesenstrand im Seebad Tossens startete bei bestem Sommerwetter die erste „Kids-Watt- Academy“ an der Nordsee. Das Thema: Müll im Meer. TOSSENS Flux und Fluse, die Maskottchen des NWZ -Kinderclubs werden auf dem Weg zur Bühne sogleich von Kindern angesprochen. Moderator Mike Wilkes aus Oldenburg fragt in das voll besetzte, 500 Quadratmeter große Festzelt: „Seid ihr alle ausgeschlafen, kleine Forscher?“ 150 Kinder im Alter von sechs bis 14 Jahren rufen „Ja“ – und nach nochmaliger Aufforderung ganz energisch „Ja“. Am Friesenstrand im Seebad Tossens startet bei bestem Sommerwetter die erste „Kids-Watt- Academy“ an der Nordsee. In weiteren Zelten mit sechs verschiedenen Stationen erfahren die Kinder anschaulich Wesentliches zum Thema Müll im Meer. Dafür sind mit im Boot: fachkundige Erklärer der Nationalparkverwaltung, des Nationalparkhauses Fedderwardersiel, des Nabu, des BUND, der Mobilen Umweltbildung für Friesland, Wittmund und Wilhelmshaven sowie des Klimahauses Bremerhaven und des Oldenburgisch-Ostfriesischen Wasserverbandes (OOWV). „Wir alle zusammen wollen Geschichte schreiben und ein Zeichen setzen“, sagt der Moderator und fügt hinzu: „Wir wollen den Naturschutz voranbringen nach dem Motto ’Kein Müll im Meer’“. Christoph Muth (Direktor des Mitveranstalters, des Tossenser Ferienparks von Centers Parcs) weist auf die vielen Helfer hin, besonders auf zwölf Schüler der Tossenser Zinzendorfschule, die für Erfrischungen sorgen. Butjadingens Tourismus-Geschäftsführer Robert Kohwitz stellt den Einsatz der Initiatorin Ulrike Hartinger-Muth heraus. Ebenso wünscht Thomas Dzillum, Vorsitzender des Bürgervereins Tossens, den aus der Region, aber auch aus Nordrhein-Westfalen und Bayern kommenden Kindern viel Spaß. 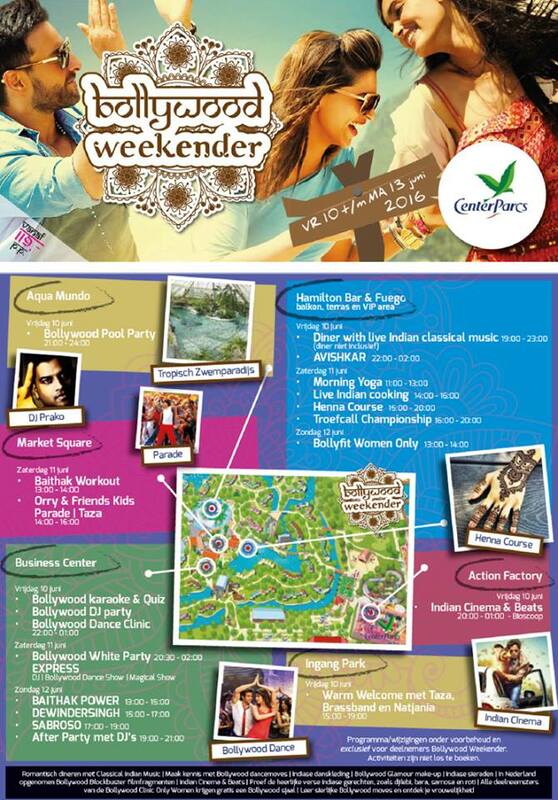 Bollywood Weekender, een weekendlang volop activiteiten in het teken van Bollywood. 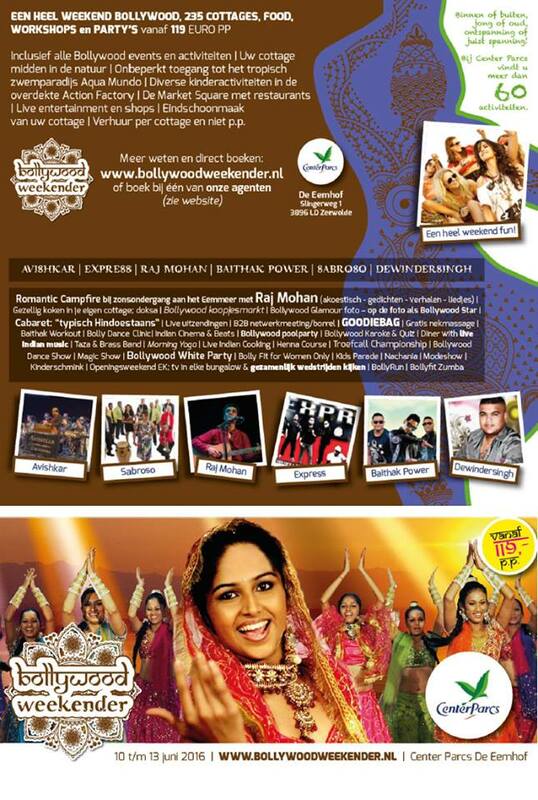 Geniet in het weekend van 10 juni drie dagen lang van live Bollywood muziek, optredens, food, workshops, dans, films, party's en andere activiteiten! Heeft u altijd al kennis willen maken met de Bollywood dancemoves of wilt u meedoen aan de Bollywood karaoke en quiz? Boek dan uw cottage voor het weekend van vrijdag 10 t/m maandag 13 juni in De Eemhof. Een super leuk evenement waarbij de deelnemers hun radiografisch bestuurbare model wagen zo mooi mogelijk over een parcours moeten laten glijden. De winnaar wordt gekozen door een vakkundige jury. The opening of the new Elveden Forest Treehouses is just a few short weeks away, and soon we’ll be bringing you your exclusive first look inside. But if you can’t wait until then, why not have a peak at our existing Treehouses at Sherwood and Longleat Forest? TheChristophalos made this slick, expertly edited film to show you the premium touches you can expect in a Treehouse, from the hand-carved sign at the entrance to the hamper of complementary goodies in the kitchen. Cortex Game Cuber brings us this child’s eye tour of the Acorn Treehouse at Sherwood Forest. It’s a thorough tour that takes in every inch of these magnificent structures. Find out more about the Treehouses and take our own virtual tour here. The post Video: Center Parcs Treehouses through the eyes of our guests appeared first on Under the Treetops. It’s that time of year again when our woodland creatures’ offspring start exploring the forests on their own. Badgers are nocturnal so it’s very rare to capture a colour shot of them out and about in the daylight. Though the nighttime photo on the left is also pretty great – especially the one climbing up that log to snuffle around for insects! Badgers have excellent hearing and a strong sense of smell, which helps them find food, but their eyes are small and their eyesight is not very good. The post Baby badgers caught on camera appeared first on Under the Treetops. VIO: Very Important Orry: word jij VIO! De winnaars worden bekend gemaakt op dinsdag 14 juni. Je hebt trampolines... en je hebt Jump XL. Wát een cool trampolinepark! Voor kinderen en ouders, voor beginners en gevorderden. Avontuurlijk, sportief, dynamisch - en indoor, dus ook springpret als het regent. Kom dus free jumpen, extreme jumpen, fit jumpen of kids jumpen en beleef een unieke 360° springervaring. On 14 March 2016, the Pierre et Vacances-Center Parcs Group (Paris:VAC) signed a new €200 million revolving credit line to refinance the syndicated loan due to mature in 2019 ahead of schedule. As such, the Group now has a confirmed credit line, reimbursable at maturity, of a higher amount than the remaining balance of the previous amortisable syndicated loan of €142.5 million on 30 September 2016, and at a lower interest rate. Maturity has been extended to 2021, later than maturity of the ORNANE exchangeable bond (2019). On 30 March 2016, Chinese group HNA Tourism subscribed to a reserved rights issue representing 10.0% of the capital of Pierre et Vacances SA post-operation, or 980,172 new shares at a unit price of €25.18. Following this operation, the holding company controlled by Mr Gerard Bremond, S.I.T.I, has an individual stake2 in the capital of Pierre et Vacances SA of 39.83% and 56.42% of voting rights. The stake acquired by HNA Tourism in Pierre et Vacances SA comes under the framework of the partnership agreement signed on 6 November 2015 aimed at developing tourism destinations in China, inspired by the Center Parcs and Pierre & Vacances concepts. If you’re arriving early on Friday, bring a pool bag with all your costumes, towels and flip-flops with you. Head straight to the Subtropical Swimming Paradise and splash away the time before you can head over to your Lodge. Why not surprise your deserving Dad by booking a private family cabana in advance, so he can put his feet up and relax in style on the comfy seats with complimentary soft drinks and your own TV? Once you’ve towelled off, make your way to the Cycle Centre to pick up your family fleet for the weekend. On two wheels is the best way to explore the forest and get to your activities. Seeing as it’s Father’s Day, why not upgrade to a premium mountain bike, available at Sherwood and Woburn Forest? With a lightweight frame, great gear range and hydraulic suspension – not to mention to snazzy neon green paint job – he’ll be the most stylish Dad on the Village. Don’t worry if you’ve forgotten to pick up a little something for Dad to open on the big day – we’ve got you covered. There are great gifts in Time For Shade, with sunglasses and watches from big brands such as Oakley, Ray-ban and Henry London. If he’s more of an adventurer, why not book a session at the Outdoor Activity Centre, where you can tear up the track together in Quad Biking, or pick sides at Paintball? You needn’t miss any of the Euro 2016 matches over the weekend, with Sports Café showing the lot on the big screens. It’s the ideal place for the whole family to relax for a couple of hours; enjoy some great food and watch the match – little ones will love the indoor play area. If that gets you feeling all competitive, you can set up a family tournament of Table Tennis or Badminton in the Sports Plaza. On the big day itself, get off to the right start with breakfast at The Pancake House. Treat Dad to a Cookie Monster stack with fluffy American pancakes, chunks of real cookie dough and topped with fresh whipped cream. Maybe even stretch to a gourmet milkshake sundae – go on, he deserves it! Hit the lake in the afternoon and take the whole family for a spin on the water in one of our effortless Electric Boats – they do all the hard work while you soak up the views. To round off your short break, there’s no better way to celebrate than with a great meal together. What’s your family favourite – stateside style with a platter at Huck’s American Bar and Grill or the exotic, authentic flavours of Rajinda Pradesh? Perhaps it’s a night relaxing in your Lodge you fancy, with a round of pizzas from Dining In. With all that and so much more to get stuck into this Father’s Day, there’s no excuse not to give Dad the fantastic family break he deserves. The post A fantastic Father’s Day in the forest appeared first on Under the Treetops. Een enthousiaste groep surfers heeft vergevorderde plannen om naast Center Parcs De Eemhof een surfpark te realiseren in het Eemmeer. Als ‘stip op de horizon’ voor de realisatie van het project is het voorjaar van 2018 uitgekozen. Na ruim twee jaar onderzoek, heel veel praten, plannen en lobbyen, zijn de voorbereidingswerkzaamheden in volle gang. De initiatiefnemers hebben de juiste partners, de steun van de omliggende gemeenten en gebiedscoöperatie Gastvrije Randmeren. En de leverancier Wavegarden S.L. is enorm enthousiast over onze locatie. Kortom: als alles volgens plan verloopt, kan binnenkort de realisatie van start gaan. Een wavegarden is een ondiepe pool ter grootte van een voetbalveld waarin kunstmatige golven worden geproduceerd door een revolutionaire golven-machine. De golven van deze wereldklasse surfspot zijn in hoogte, kracht en snelheid aan te passen. Zo zijn de golven geschikt voor ‘die hard surfers’, maar ook voor minder ervaren surfers. Ook beginners en kinderen kunnen er veilig op leren surfen. Iedereen is dus welkom. Toegangskaarten zijn los en als abonnement verkrijgbaar. De pool biedt ruimte voor meerdere surfers tegelijk. Spectaculair dus voor zowel de surfers in het water als voor het publiek aan de kant om van dichtbij naar te kijken. Zomervakantie Last Mintues: Word één met je eigen natuur deze zomer! TIP: de eerste weken van juli zijn zeer scherp geprijsd! Kijk! Hier worden vakantieherinneringen gemaakt! In volle vaart waterskiën en wakeboarden, of rustig zeilen en duiken. Uw kids verzorgen hun eigen pony en kunnen samen een ritje maken. Ze gaan Vlotten en Hutten bouwen. 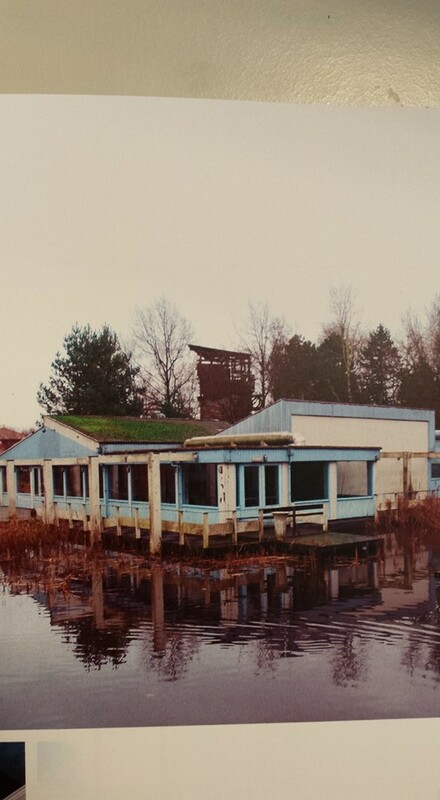 En supersnelle wildwaterbaan en glijbanen bedwingen in de tropische Aqua Mundo. Of ze kruipen in de huid van een Boer, Indiaan of zelfs een Piraat met ons Wannabe-programma. En is dat een konijntje en een eekhoorntje in uw privétuin? Kijk, zelfs een hert! Center Parcs is de bestemming voor een zomervakantie met het hele gezin, midden in de prachtige natuur. Volop afwisseling en altijd wat nieuws, voor iedereen. Het is de natuurlijke plek om uzelf te zijn, samen met de kids. Ook tijdens het EK voetbal kan je bij Center Parcs komen genieten. "Europa speelt voetbal – wij niet, maar genieten doen we wel!" Ook zijn er 2 commercials gelanceerd. Een voor Belgie, een voor Nederland. Nederland is een land vol voetballiefhebbers. Het is ontzettend jammer dat we dit jaar niet bij het grote voetbalfeest in Frankrijk kunnen zijn, maar we gaan zeker van een ontspannen voetbalzomer genieten! Een spannende vakantie is het bij Center Parcs altijd, maar vanaf 10 juni is een vakantie bij Center Parcs nóg spannender – want dan begint het voetbalfeest ook bij Center Parcs! Naast de leuke zomeractiviteiten die je bij Center Parcs sowieso kunt uitproberen, staat jou en je gezin tijdens het voetbalfeest een scala aan bijzondere activiteiten te wachten.